In this paper we consider a model in which agents have complete information about their neighbors and, possibly, incomplete information about the rest of the environment. We consider two different informational frameworks. In the first, agents do not have priors about the relevant characteristics in the rest of the environment. In the second, agents are supposed to have priors about the unknown characteristics. 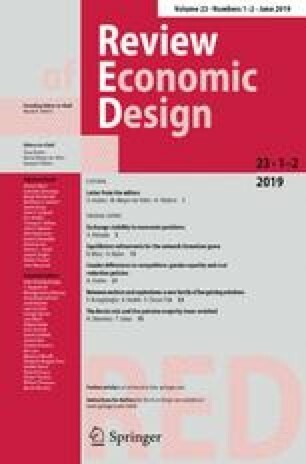 We present a mechanism which implements any social choice correspondence satisfying monotonicity and no veto power in both informational settings for every possible prior thus requiring little knowledge from the point of view of the designer of the information possessed by agents about the environment. The authors wish to thank J. Canals, B. Chakravorty, P. Chander, C. Herrero, G. Orosel, D. Schmeidler, W. Thomson, W. Trockel, F. Vega, A. Villar, T. Yamato and two anonymous referees for helpful comments. The usual disclaimer applies. The first author acknowledges financial support from the Institució Valenciana d’Estudies i Investigació; L.V.I.E. and DGICYT under projects PB/88-0289 and PB/91-0756. The second author acknowledges financial support from DGICYT under project PB/90-0156. A previous version of the paper was written when authors visited (May 1991) the Institute of Mathematical Economics (Bielefeld) to which authors are grateful.